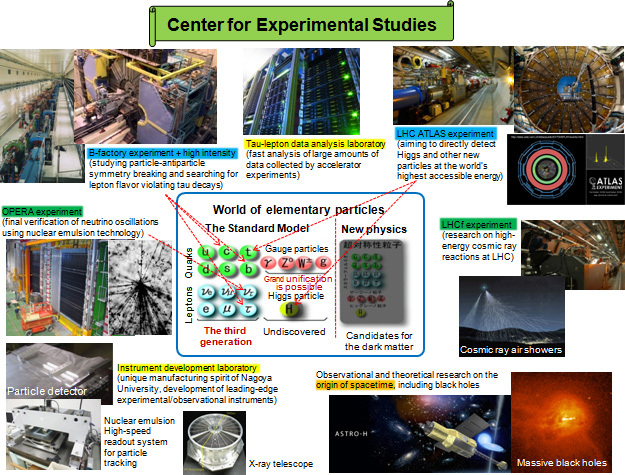 The Center for Experimental Studies aims to elucidate phenomena related to the origin of our universe, from elementary particles to the large-scale structure of spacetime. At the Division of Flavor Physics, the Tau-Lepton Physics Group and the Fundamental Astroparticle Physics Group both conduct accelerator experiments: the ATLAS and the LHCf experiments at the Large Hadron Collider (LHC) at the European Organization for Nuclear Research (CERN) in Switzerland and the B-factory experiment at the High Energy Accelerator Research Organization (KEK) in Japan. While the Tau-Lepton Group focuses on the elementary particles produced at these facilities, the Astroparticle Physics Group focuses on bridging elementary particles and the universe at large. The Division of Origin of Spacetime Structures, which consists of the Observational Astrophysics Group and the Theoretical Spacetime Analysis Group, conducts observational and theoretical research related to the origin of spacetime structure of the universe, including black holes. To produce front-line research results in a timely fashion, a powerful dedicated computer server (Tau-Lepton Data Analysis Laboratory) is fully utilized to promptly analyze data collected by experiments at CERN and KEK. In addition, the center contains the Instrument Development Laboratory, which can develop original instruments required for our observations and measurements.